“Content” was the word I chose for 2015 (you can read my original post on it here), and I’ve been thinking a lot about that lately. The reason I chose content as my focus for 2015 was because as I neared the end of 2014, I felt very discontent. We were coming up on four years in our apartment with no end in sight, saving up for a down payment on a house pretty much since we got married. After two years of unofficially trying to have a baby (basically by that I mean we weren’t charting things or being intentional about it but we also weren’t preventing), we were going to see an infertility doctor, and every pregnancy announcement caused my heart to sink a little. I felt like I was watching everyone have Big Life Moments while I was treading water. This year, I want to wake up every day and be thankful. I want to see pictures of other people's successes and be happy for them without feeling bad that I don't have what they do. I was just settling in for the long infertility haul when we found out we were pregnant. I had made my peace with living in our apartment another year when we decided to sign a six-month lease and find a house by the summer. We are now brand-new homeowners and preparing a nursery to welcome home a baby in just a few weeks. From the outside looking in, it would be easy to say I have every reason to be content. And yet I struggle with this every day, and in some ways I need to focus on being content more than ever. It's hard to admit that because I just think that's so sad, and it makes me feel really lame. I mean, what kind of a person has so much to be thankful for and yet still struggles with being content? I know it's overused. I know you've seen it 1,000 times. But I can't find anything better than this C.S. 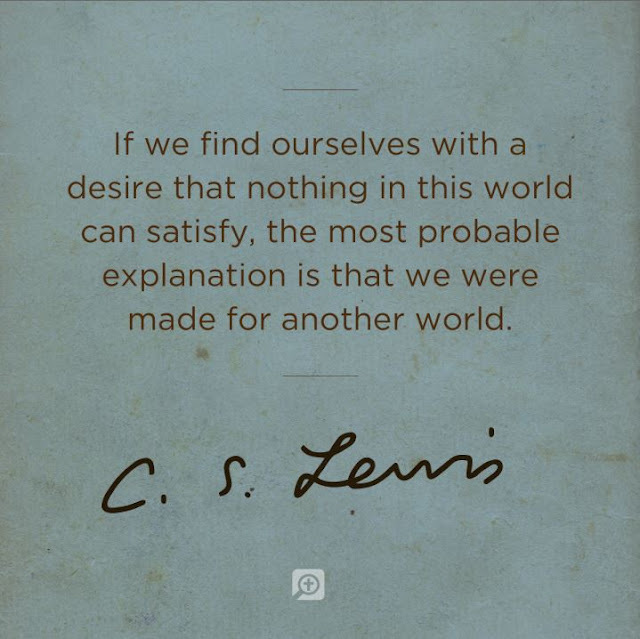 Lewis quote to express why it's so hard to be content. We weren't made to be content here. It's really a beautiful truth if you think about it. Maybe you don't struggle with being content, but I do. And if you do too, you aren't alone, and there's nothing wrong with you. But don't focus on it. Don't focus on the things you don't have. Focus instead on being thankful and realize that finding contentment is really, really hard. It's not something I'm going to master this year, or actually ever; it's something I am going to have to practice for the rest of my life. I think it's been good for me to realize that. Even when I get what I want (or what I think I want), I'm not ever going to be truly satisfied, because I can and should only find contentment in Jesus. That's what I've been praying about lately and what I will continue to focus on this year and in the years to come. Did you choose a word for the year? How's it going? Do you struggle with being content even when it seems like you have so much to be thankful for? I think once we learn to be content with what we have, God starts to bless us. This was my experience in meeting my husband, starting graduate school, etc. etc. etc. So cool to see your progress on this word! So true! We definitely need to learn to be content before we can be blessed with more. Yes yes yes. C.S. Lewis is the man. That quote is just so true. Contentment has been a battle for me for a long time. Some days I feel like I've nailed it, other days I feel like I'm back to square one. Being content has always been a struggle for me. I'm always waiting for the next big change in my life and need something to look forward to get me through most days. Wow. That sounds depressing, but I've always been so goal-minded that once I accomplish one thing, I'm ready for the next. I think, for me, being content happens in little moments: sitting on the patio and reading a book, slow Sunday mornings, finishing a big project at work, going out to dinner with my husband. Feeling content overall is much more difficult, but I know I have to be intentional about it and know that it's something that will always need work. I totally agree that contentness is found in the little moments. I feel so at peace in those times. It's when I look at the big picture-- "It would be so nice to have _____"-- that I struggle. Social media is probably a huge cause of that, because it's so easy to see what other people are buying/doing that it's easy to feel like you will never have enough. I get so frustrated with myself, but I'm thankful that each day is a new opportunity to be better than the day before! When I look around, I often feel like the luckiest girl in the world, but I always struggle with feeling discontent. Most of the time, I don't even know why! It just feels like something is missing or I'm not quite running on all cylinders. I love this post - both to know I'm not alone in this feeling and also to remind myself of the reason I feel this way. I'm so sorry to hear you struggle with this still. For me, personally, and I hope you don't take offense to this, it was a must for me to learn to be happy in my life / this world as you said. Life is too short to be unhappy, jealous or always wanting more, which I was - constantly. It was so draining. I had to actively work at it, every day. I still struggle with it, of course. I see things and I wish they were happening in my life. I am terrified of the future and the troubles we *might* face. I wish we had more money so that we could travel more and I could visit my family. I wish I could smoosh the 2 countries together and I am sometimes so jealous of people who are (geographically) close to their families and their inlaws I want to yell at them for complaining about their family for some reason or another. I used to get jealous that my house was small and our cars weren't new. That I've never been a bridesmaid, nor will I be. That so and so has a thousand friends and I have 3. Anyway. I'm not trying to make this all about me (I have such a knack for doing that!) but this is something I thought about constantly. I was also a super negative person, which didn't help, and (online!) you don't seem to be like that, which is good :) Anyway. I finally started asking myself what's important, what would I do without xyz so that I could actively be more thankful and appreciate my life. Yes, I wish we had more money so I could travel, but if something happened to my husband I wouldn't want to travel. I'd want to be with him, because he's my favourite person. He makes me happy and satisfied. Same with friends. I made an effort to make more friends but ended up with a bunch of useless acquaintances and then I didn't have time for my real friends. So I got rid of the acquaintances and focused on my real friends, because they are enough. Anywho. I'm not saying that you are focusing on these things, just that you deserve to be happy and content every day. I don't take offense at all :) All the things you said are true! I get frustrated with myself sometimes because I really am happy with my life and the things I have, but I still have to remind myself of that when I see pictures of people's awesome travels or the cool things they bought. I think it's hard with social media to not compare yourself to others about some things. But I really am so thankful for all the things I have. And you're right: we all need to learn to be happy in life. Life is definitely too short to spend it wishing it were different. AND, I totally could have more money if I were a doctor or something, but I HATE science! So I'd rather have less money but work at a job I enjoy than do something I hate even if I got paid more. It's all about perspective! It must be really hard to live that far away from your family. I'm glad I live so close to mine. Wow....such big changes for your little family this year! All so awesome and exciting! I'm just so happy for everything and how it's coming together for you! For some reason I have never really struggled to be content. I don't know if it's because I spent my formative teen years surrounded by so much poverty that I knew every single day how lucky I was just to have a roof over my head (and this is why I was living in China so we didn't have a/c or hot water in our apartment - and we were the wealthy ones). Or if it's a personality thing or what. I know I'm kind of eternally optimistic so that's probably part of it too - that I'm more prone to focus on the good than the bad. I know, though, that what you're describing is so real. And so common even. I hear it a lot (and not in a "whiney woe is me" way) from people I know. It really can be a true struggle. I love that you're battling it, though. That you are waking up and choosing to be grateful and focus on the good. That's like me with self control. It's a battle for sure. I admire your honest heart, friend. Contentment is a big battle for so many of us and I don't know why. Here I am in Myanmar living the dream of serving abroad and helping missionaries and every now and then I look around and think "Man! People back home have homes and families and can blog normal and here I am in Myanmar." Discontentment can creep in so quickly. Last weekend Dave and I went to the beach, it was kind a really local place but the thing that stuck out to me the most was how they had nothing and were so happy. The kids were just happy to slide around on the rocks and there was even a beggar girl who we bought water, soda and quail eggs (so gross!) BUT she was so so happy she got the biggest smile and started dancing. Seeing people here like that has put a lot of things into perspective for me. LASTLY (sorry this is so long) but I think you have come a long way. I can see it in the comments you leave on my blog and on other blogs. Your attitude is one to bless and encourage others for their blessings and I think that in and of itself is a choice to be content and happy for others. So I'm just now catching up on blogs after being out of the country, but THIS! Yes. Oh, contentment is so elusive, isn't it? You aren't the only one to struggle with it, all while acknowledging the good you have and that Jesus is our all in all. Being content is a daily thought process, and in a way, I'm glad. It keeps me humble. It keeps me coming back to the foot of the cross. My flesh wants to dwell on the 'if onlys'. If only God would allow me to quit my job. If only God would allow us to spend more of each year in Zambia. If only God would allow the path of adoption to be easier. But that's not honoring of Him, and honestly, I feel it show my lack of trust in His plans when I dwell on those thoughts. Sometimes it's with much sighing and shaking of my head, but I then choose to focus right back on Jesus and what He has for me in this one moment.